On August 23, 2003, Beech 1900D N240CJ underwent a Detail Six phase maintenance check (aft fuselage / empennage). The phase check was interrupted, and the remaining work was deferred on the morning of August 24. Ten revenue flight legs were completed that day, and the Detail Six phase check resumed on the evening of August 24, and concluded on August 26. During the check both elevator trim actuators were replaced. During this procedure the Aircraft Maintenance Manual (AMM) was not strictly followed and the elevator trim tab cable unwound off the forward drum. The forward elevator trim tab cable was then replaced. During the replacement of the cable, the maintenance personnel skipped a step in the AMM. They did not use a lead wire to assist with cable orientation. In addition, the AMM incorrectly depicted the elevator trim drum, and the depiction of the orientation of the cable around the drum was ambiguous. On the evening of August 26, N240CJ was to be repositioned to Albany. When the flightcrew received the airplane, the captain did not address the recent cable change noted on his maintenance release. The captain also did not perform a first flight of the day checklist, which included an elevator trim check. Shortly after takeoff from runway 24 the pitch trim control moved from 1.5 to approximately 3 degrees negative (nose down). Ten seconds later the pitch trim control moved to an approximate 7 degree negative position, where it remained for the duration of the flight. The pilot declared an emergency and reported a "runaway trim." The airplane flew in a left turn and reached an altitude of approximately 1,100 feet. The flightcrew subsequently requested to land on runway 33, upon which ATC cleared the flight to land on any runway. While attempting to return to the airport, the plane then pitched nose-down, and impacted the water at an approximate 30-degree angle. The Beech came to rest in approximately 18 feet of water, about 100 yards from the Yarmouth shore. 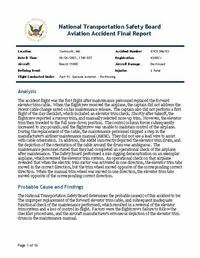 PROBABLE CAUSE: "The improper replacement of the forward elevator trim cable, and subsequent inadequate functional check of the maintenance performed, which resulted in a reversal of the elevator trim system and a loss of control in-flight. Factors were the flightcrew's failure to follow the checklist procedures, and the aircraft manufacturer's erroneous depiction of the elevator trim drum in the maintenance manual." Distance from Hyannis-Barnstable Airport, MA to Albany Airport, NY as the crow flies is 312 km (195 miles).